Dan Glickman worked as a trial attorney for the Securities and Exchange Commission before becoming a partner at the law firm of Sargent, Klenda and Glickman. In 1976 he defeated incumbent Garner Shriver and won a seat in the House of Representatives, and spent 18 years representing the citizens of Kansas's 4th congressional district. Congressman Glickman specialized primarily in agricultural matters, although he also chaired the House Permanent Select Committee on Intelligence. Among other things, he launched an inquiry into the Aldrich Ames spy case. 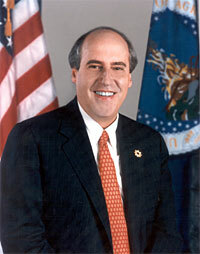 After his defeat in 1995, Glickman was chosen by President Clinton to serve as Secretary of Agriculture. There he oversaw sweeping meat inspection reforms, including the implementation of the HACCP (Hazard Analysis and Critical Control Point) program. After Bush won the White House, Glickman left government. In July 2004 Glickman was named Jack Valenti's successor as the president and CEO of the MPAA. "I hope to be half the man Jack Valenti is. It's going to be a hard act to follow."